...and, Francis Revisited (Ravelry Link). I love this pattern. I did make some mods in guage which was really easy. I've worn this many times since finishing and get a lot of compliments whenever I wear it. 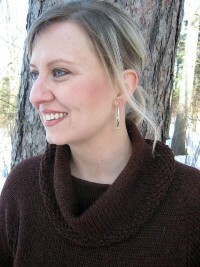 I used Cascade 220 Heathers in a brown with red speckles. I would love to make it again in something more squooshy. Yes, that's a technical term. This is my favorite handknit sweater. I highly recommend the pattern. The only finishing I didn't complete was tacking down the back collar. I was too eager to wear it. Fake Isle Hat (Ravelry Link). Published in Magknits November 2006. This is a great pattern. I've been wearing this on the cold winter weekends. The colors make me smile! I used Noro Kureyon and the leftover Cascade 220 Heathers from Francis Revisited (above). Star Crossed Slouchy Beret (Ravelry Link). Again, knitting from my stash with Cascade 220 Heathers. Not sure what happened with the "slouchy". I had gauge issues as usual. If I were to make another, I would add a cable repeat in hopes of more slouch. I haven't been blogging, because I've been knitting. Here's something new on the needles. This is the beginnings of the Fountain Pen Shawl from Interweave Knits Spring 2009. I'm so addicted to lace these days that I had to cast on with some lace that I got from my Mom for my birthday. I'm not sure what kind of lace it is because the tag fell off, but it's two-ply silk something-something. Thanks Mom! You rock like a gravel pit, I'm not kidding. (and yes, that's a compliment). And, I have to show off my darling nephew (J.D.) and my sister (Pookie). They went to a wedding last weekend. Here they are, all fancy. Awwwww. J.D. 's vest is tres cool, no? I wonder where it's from and who made it? Sorry dude. I dream of handknits for you and then realize you'll soon grow out of them. Bad Auntie Hollyknitlightly. I love all the knits but the sweater is my fav! Yours turned out beautifully and I love the color. Now if only I could finish mine! Actually the vest is from Target...but it's really nice. Some day you can knit him something cool to wear! I love the brown sweater. It's awesome! Isn't it fun to knit something you actually wear? For me, that doesn't happen often so I gotta enjoy it when I can!